We were at the Dundee International Women’s Centre today doing sensory trays with the mums and little ones in their flourish group. 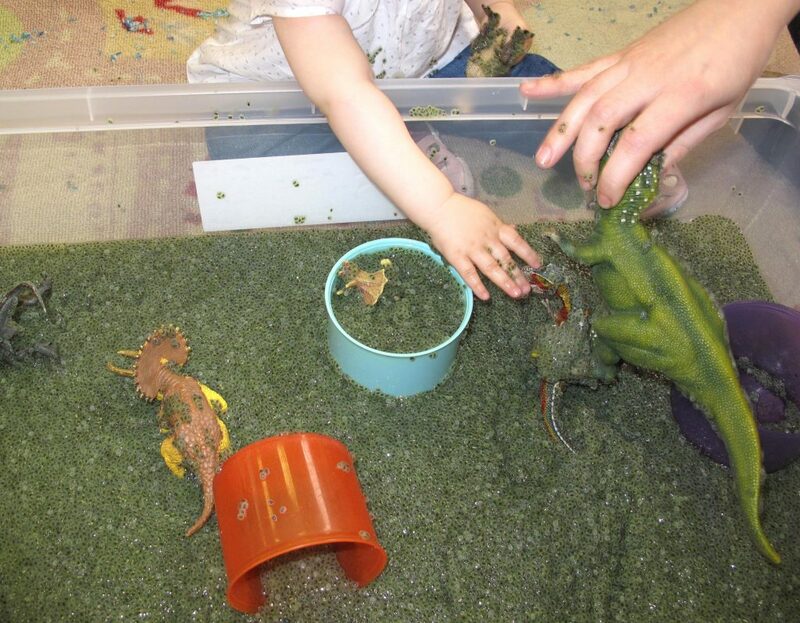 Sensory trays are a nice way to let children explore different textures and use their imagination to create small worlds. It can also extend the possibilities of their existing toys, as you can see here. 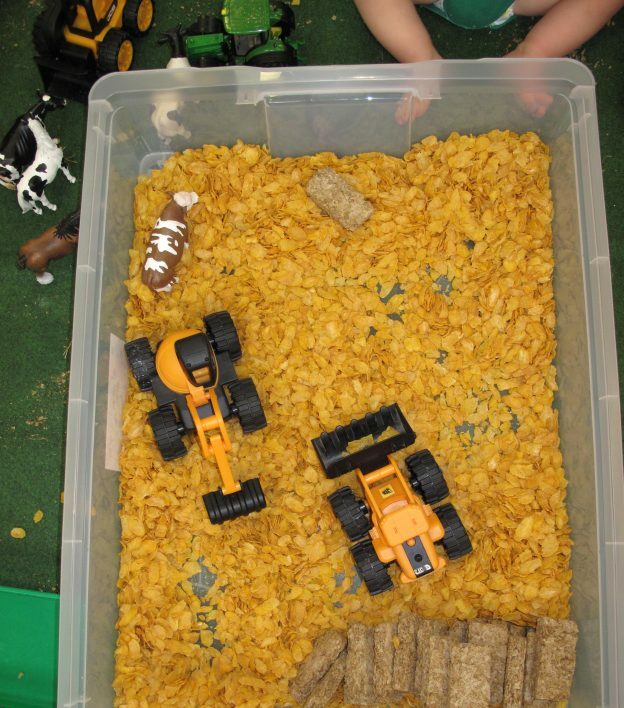 We made a farm tray really easily using cornflakes as a base and wheat biscuits to make hay bails. It gave new ways to use toy tractors and diggers for moving the bails about and we added some farm animals for fun. And it didn’t matter if some of the wee ones had a taste! 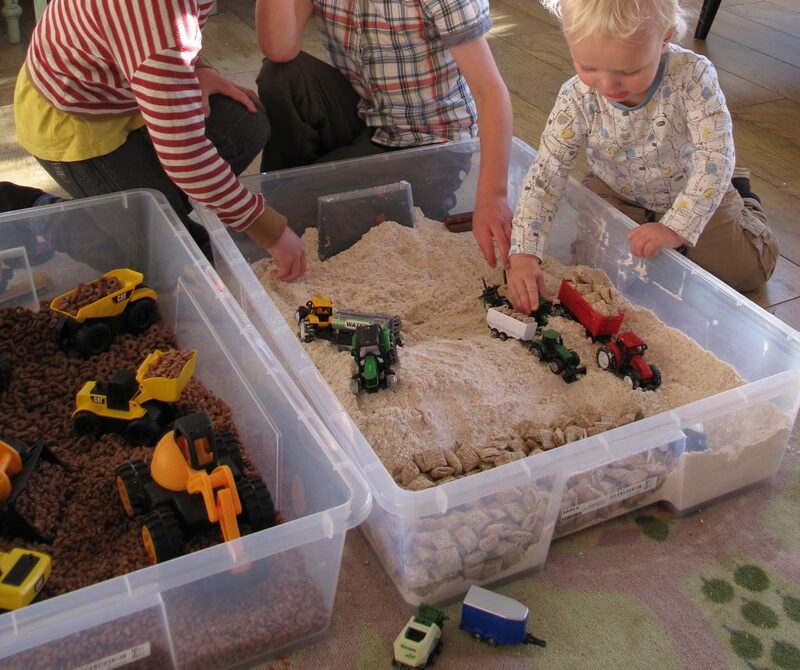 This is another version of a farm based sensory tray using chocolate cheerios for a building site and some cornflour and shredded wheat on the farm. and a swampy dinosaur tray using a squishy jelly mixture made from basil seeds. You can order these seeds easily online. They start tiny and black but if you leave them in water overnight they soak it up and get a cool, squishy, frog spawn texture. If you add food colour to the water they absorb the colour too so you can colour them to your theme. They feel a bit like the water beads which you can buy but these are safe to eat and they are a bit smaller than other similar foods like tapioca pearls so there is less of a worry about choking. These three trays gave lots of different textures to be explored from slimy to dry and crunchy. It’s always nice to have some cups on hand when you do sensory trays so that children can start filling and pouring to extend the play when they run out of interest in the toys. These work well for a wide age range (0-9 all enjoy these in my house so far). I just use the big trays that they sell for under bed storage and then you also get a lid if you want to keep some for another day. This entry was posted in Uncategorised on 18th April 2019 by Vicky Armstrong. We were playing with salt dough clay today with the lovely mums and babies at the Dundee International Women’s Centre. Here is the recipe if you’d like to try making your own at home. Try letting the little ones join in with the measuring and mixing. then 1/2 cup of warm water added gradually. 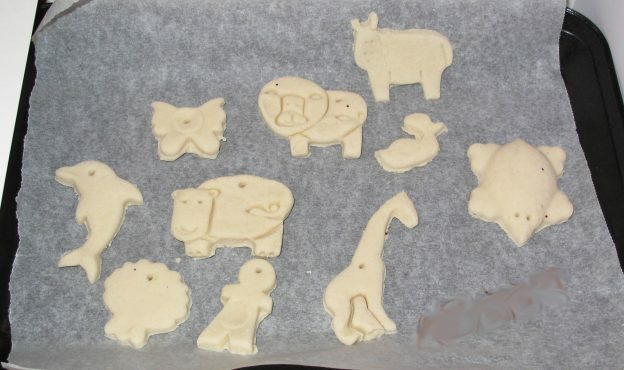 The dough will be nice for making models, doing handprints or cutting out with biscuit cutters or play dough tools. Once you have your shapes pop them on a baking tray in a warm oven (about 80c) to dry out for several hours, depending on how thick they are, until cooked through (check the back isn’t still squishy). You can then paint them and decorate as you chose. If you want to keep them nice you can also varnish them once the paint is dry. This is a nice activity as it gives a different texture for children to feel as a change from all the paint. If you kneed it for a while in your hands first it will feel nice and warm and smooth so most little ones like it. There is the fun of mixing it as well as the fun making and you can do some nice handprints to keep before letting them go free on the rest of the dough. Although this is made from food stuff obviously don’t let them eat it as it is so salty. We are going to paint ours at our next session. 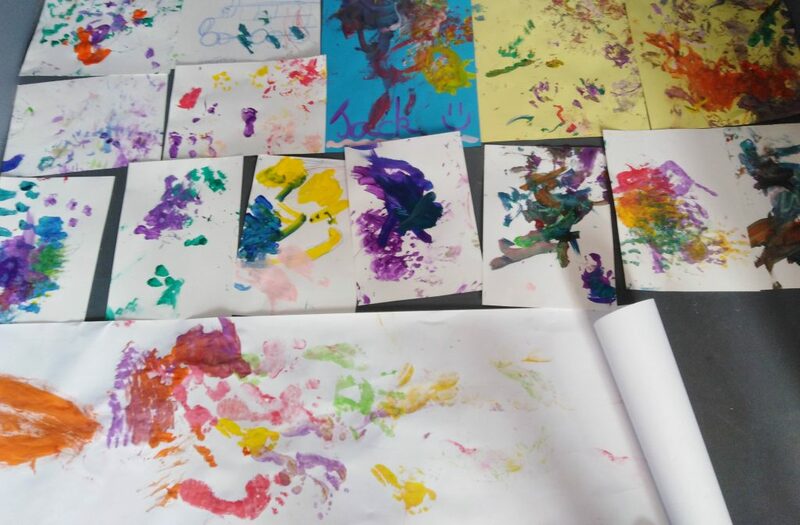 We also made some lovely hand and footprints, which make a great keepsake. This entry was posted in Art Ideas for Little Ones on 28th March 2019 by Vicky Armstrong. We are running art therapy groups for parents and their infants at DCA and at the Dundee International Women’s Centre this term. 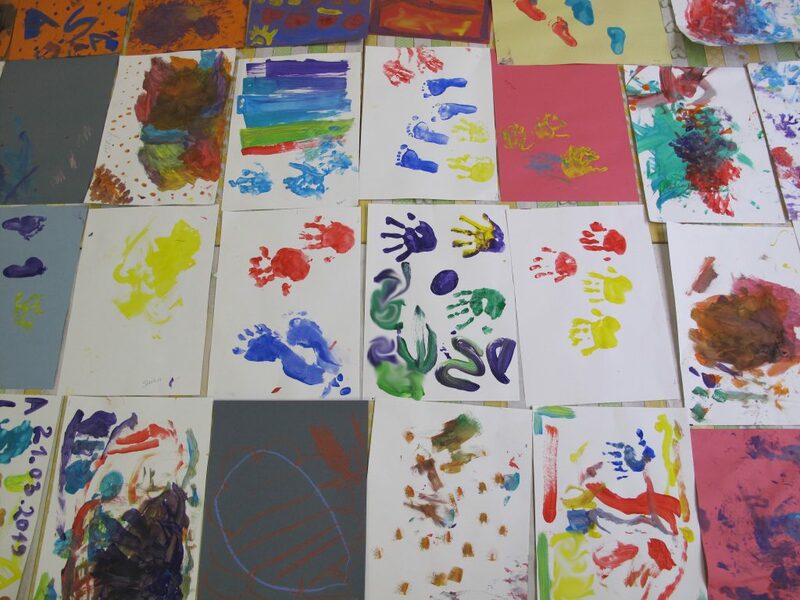 All the parents and their little ones got stuck in with painting on their first week. Here are some of their beautiful painty creations. They all definitely needed the bath afterwards, with as much paint on little people as on the paper! This entry was posted in Uncategorised on 28th March 2019 by Vicky Armstrong. 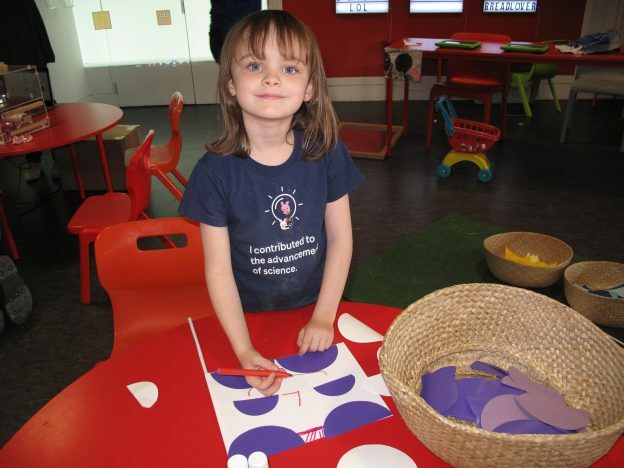 We are looking for volunteer families* to explore, draw, and discuss art. At a loss for words when you look at art? Or do you always know what to say? How can galleries help us find our voice? 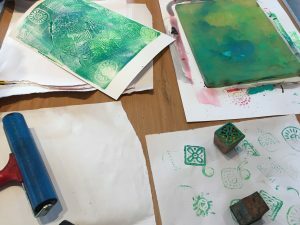 As part of the long term project Art at the Start, University of Dundee is partnering with Dundee Contemporary Arts Learning Programme to explore what happens when families view and make art together. The Talking About Art project will research how families use the self-led activities at DCA. The researcher, Holly Rumble, aims to determine how these activities impact on family engagement with the visual art exhibitions. Holly will lead the sessions, which last for 45 minutes, and take place in early 2019. We will provide refreshments and a small gift to thank you for your time. This entry was posted in Project News, Research on 30th November 2018 by Holly Rumble. We were at the DCA doing an outreach event this weekend as part of the ESRC’s Festival of Social Science. 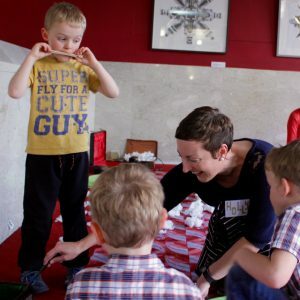 We ran some art events for families linking in with the flag theme of ther current exhibition and we tried to show a bit more about what is happening when little ones and grown ups make art together. We were thinking about making connections through art, increasing cognitive development, enjoying sensory experiences, gaining self-agency and learning to imitate. Here are some of our posters from the event with some more information. Thank you to all the families who came and joined in with us. This entry was posted in Project News on 12th November 2018 by Vicky Armstrong. The Art at the Start team are taking part in some of the events at DCA’s Discovery Film Festival over the next two weeks. This entry was posted in Project News on 25th October 2018 by Vicky Armstrong. 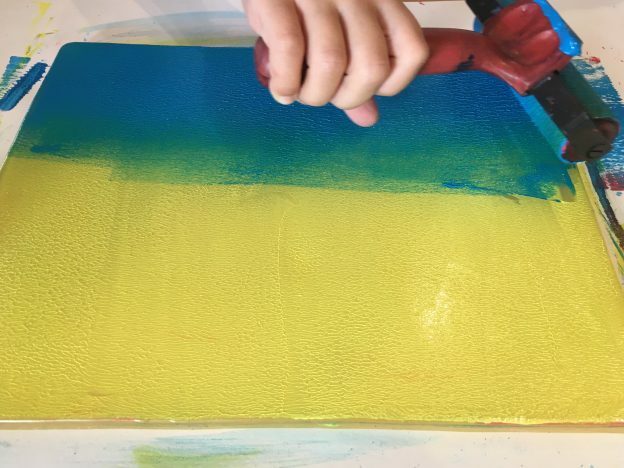 This week Vicky and Holly joined the team from DCA at “Picnic in the Park” trying out some mono printing with all the families who came along to enjoy the lovely sunshine in Baxter park and take part in the activities. We were so impressed by how creative all the children who joined in were, using jelly plates to mono print with leaves and wooden stamps. This entry was posted in Project News on 23rd October 2018 by Vicky Armstrong. We are really pleased to welcome Holly Rumble to the Art at the Start team this month. Holly won our Scottish Graduate School of Social Sciences Studentship to join us as for 4 years as a graduate student in Psychology. She will be working closely with the DCA to look at how we can measure the impact of art experiences upon families with young children. This entry was posted in Project News on 25th September 2018 by Vicky Armstrong. If, like us, you seem to collect lots of cardboard boxes, don’t just recycle them, use them for some painting first. The bigger the better so get ordering washing machines! We went with a train as we have a Thomas fan but you could easily turn them into a castle, or a car, or a submarine or a space ship………..Creations that little ones can play with by going in and out are the most fun. Make spaces to sit in or maybe some doors to open. That will give the opportunity for loads of fun interactive play. Little ones will probably need quite a lot of help with the building part so it’s a nice chance to get stuck in there. Make sure you follow their lead though and encourage them to show you how they want it to look. It is lovely for them to see something from their imagination become reality. Once it’s time for the painting part you can let them go crazy. Use water based and washable paint that is baby safe in case they have a lick and make sure you put lots of plastic or newspaper all over the floor cos this one gets really messy. 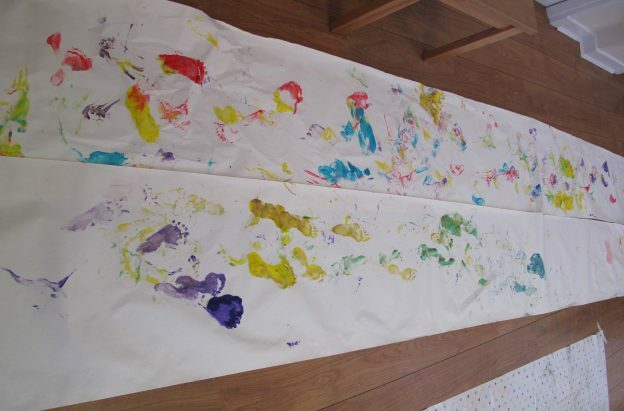 Maybe some children who feel a bit nervous starting with a big white page will feel more confident to get creative when it’s already just rubbish. And children who don’t think they like to draw or paint might like this idea as it includes the element of construction. This entry was posted in Art Ideas for Little Ones on 21st September 2018 by Vicky Armstrong. 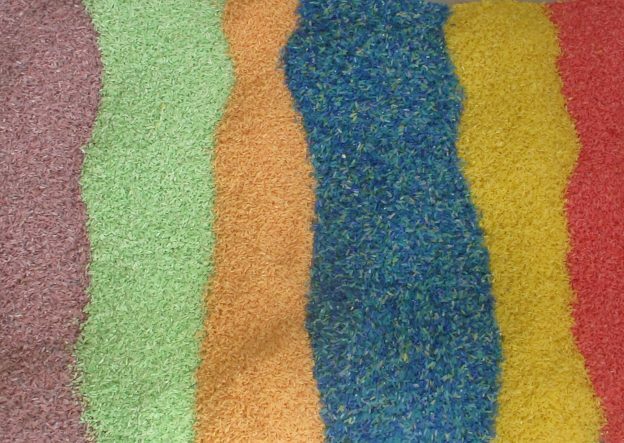 It will ultimately end up all muddled together but that is part of the fun and the multicoloured mixture looks very pretty too. Perfect for using with ice cream scoops, or maybe try with cupcake cases to scoop it into, or hide multicoloured wooden blocks in it to seive out, or use it as the sprinkles on playdough cakes, or feed it to your unicorns….. Whatever you can think of. The rice will keep for ages in an airtight bag or tub. As always adult supervision is required throughout to keep safe. 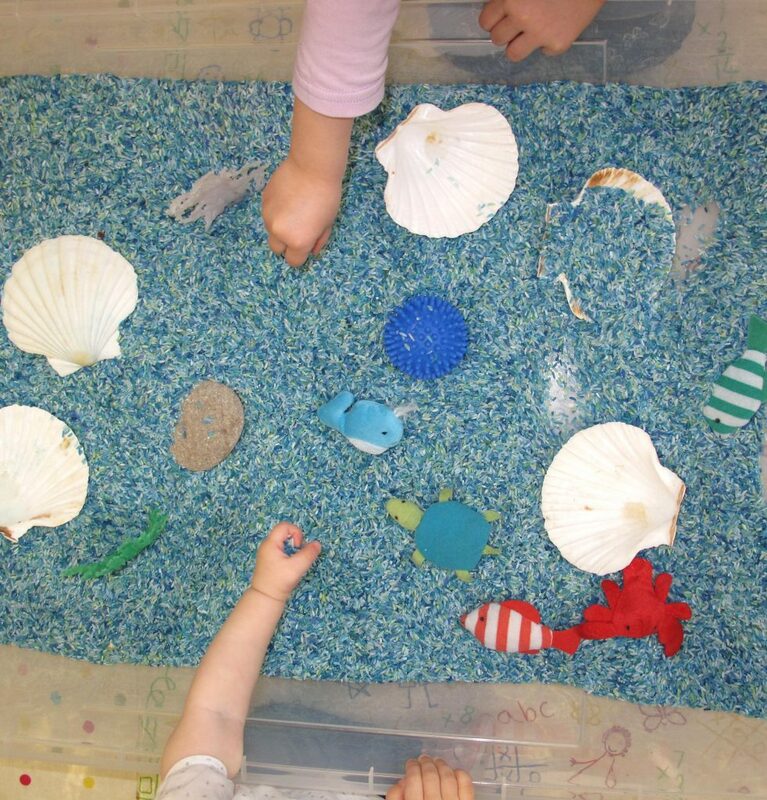 This entry was posted in Sensory Play Ideas on 28th August 2018 by Vicky Armstrong.